Forthcoming in G. Gorodetsky (ed. ), A Red Ambassador to the Court of St. James’s: The Diaries of Ivan Maisky, 1932-43. The following is a unique historical document. It is an extract from The Diaries of Ivan Maisky, the Soviet Ambassador to Britain from 1932 to 1943. As far as I am aware this is the debut online appearance of this invaluable document. 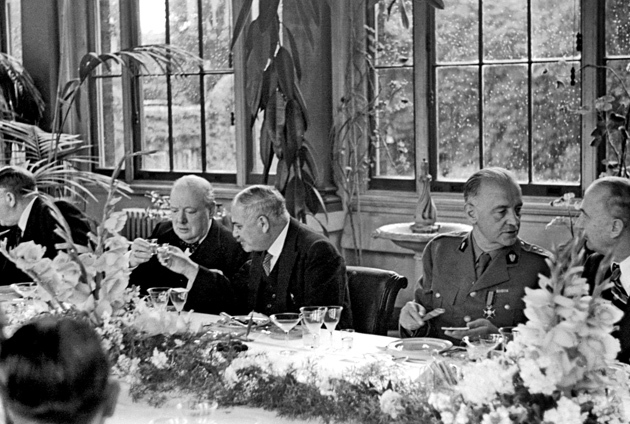 Ivan Maisky (second from left), the Soviet ambassador to London between 1932 and 1943, with Winston Churchill at the Allied ambassadors’ lunch at the Soviet embassy, September 1941. General Władysław Sikorski, prime minister of the Polish government in exile, is second from right. Maisky, a former Menshevik of Jewish origin, kept a highly personal diary. He recorded conversations with five British prime ministers, as well as with many other prominent British politicians. In this extract, written on 3 February 1941, Maisky recounts his brief meeting with the Zionist leader Chaim Weizmann, later the first president of Israel. Maisky provides crucial insights into the history of Zionism including the brutality of the Jewish plan for Palestine and the Middle East. Noticeably, the document reveals that an intention to expel the Palestinians was explored by Zionist leaders as early as 1941. Weizmann begins the meeting with a business plan. “Weizmann came to discuss the following matter,” says Maisky, “at present Palestine has no market for her oranges – would the USSR take them in exchange for furs? It would be easy to sell the furs through Jewish firms in America.” Establishing a Jewish nation is a cheerful event, but it is even better if one can earn some shekels on the side. Clearly, even in 1941, Zionism saw itself as part of a global financial venture. “I expressed some surprise about how Weizmann hoped to settle five million Jews on territory occupied by one million Arabs,” Maiky writes. It is painful that this ethno-centric approach prevailed. Seven years after this intimate meeting in London, the new Israelites expelled the vast majority of the Palestinians. Those Palestinians and their descendants remain dispossessed and many of them are forced to live in refugee camps in the region. Those who managed to evade expulsion were then and continue to be subject to Israeli racial discrimination and daily abuse. A few days ago I had an unexpected visitor: the well-known Zionist leader Dr. Weizmann. He is a tall, elderly, elegantly dressed gentleman with a pale yellow tinge to his skin and a large bald patch on his head. His face is very wrinkled and marked by dark blotches of some kind. His nose is aquiline and his speech calm and slow. He speaks excellent Russian, although he left Russia forty-five years ago. 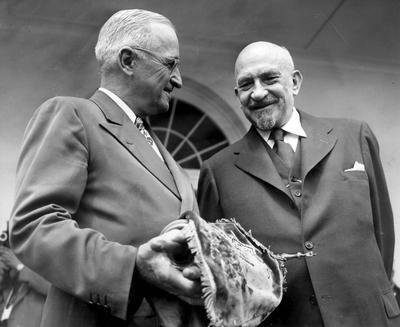 President Harry S. Truman and Israeli President Dr. Chaim Weizmann. Truman is holding a blue velvet mantle embellished with the Star of David. The mantle was a gift symbolizing Israel’s gratitude for American recognition of and support for the new nation. Weizmann came to discuss the following matter: at present Palestine has no market for her oranges – would the USSR take them in exchange for furs? It would be easy to sell the furs through Jewish firms in America. I answered Weizmann by saying that off hand I could not say anything definite, but I promised to make enquiries. However, as a preliminary reply, I said that the Palestinian Jews should not place any great hopes on us: we do not, as a rule, import fruit from abroad. I was proved right. Moscow turned down Weizmann’s proposal, and I sent him a letter to that effect today. Here he began to set out his fears. The English – and especially their colonial administrators – don’t like Jews. This is particularly noticeable in Palestine, which is inhabited by both Jews and Arabs. Here the British ‘high commissioners’ undoubtedly prefer the Arabs to the Jews. Why? For one very simple reason. An English colonial administrator will usually get his training in British colonies like Nigeria, the Sudan, Rhodesia and so on. These places have a well-defined pattern of rule: a few roads, some courts, a little missionary activity, a little medical care for the population. It’s all so simple, so straightforward, so calm. No serious problems, and no complaints on the part of the governed. The English administrator likes this, and gets used to it. But in Palestine? 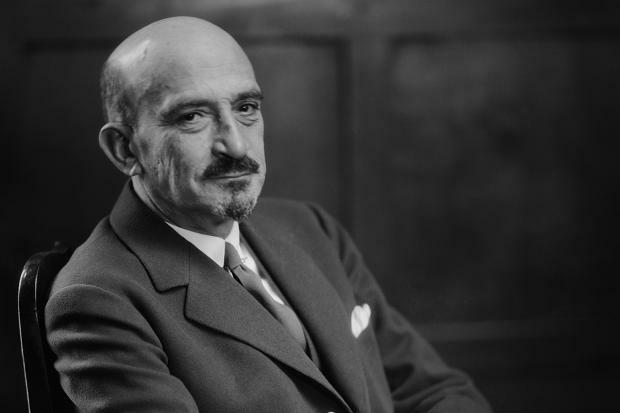 And then, taking all these circumstances into account, Weizmann anxiously asks himself: ‘What has a British victory to offer the Jews?’ The question leads him to some uncomfortable conclusions. For the only ‘plan’ which Weizmann can think of to save central European Jewry (and in the first place Polish Jewry) is this: to move a million Arabs now living in Palestine to Iraq, and to settle four or five million Jews from Poland and other countries on the land which the Arabs had been occupying. The British are hardly likely to agree to this. And if they don’t agree, what will happen? I expressed some surprise about how Weizmann hoped to settle five million Jews on territory occupied by one million Arabs. *Dr Chaim Weizmann, President of the World Zionist Organisation and the Jewish Agency for Palestine, 1921–31 and 1935–46; President of the State of Israel, 1949-52.